The boa constrictor that escaped from a pet shop in a shopping mall in Plovdiv was found and caught on the night of 6th of February. 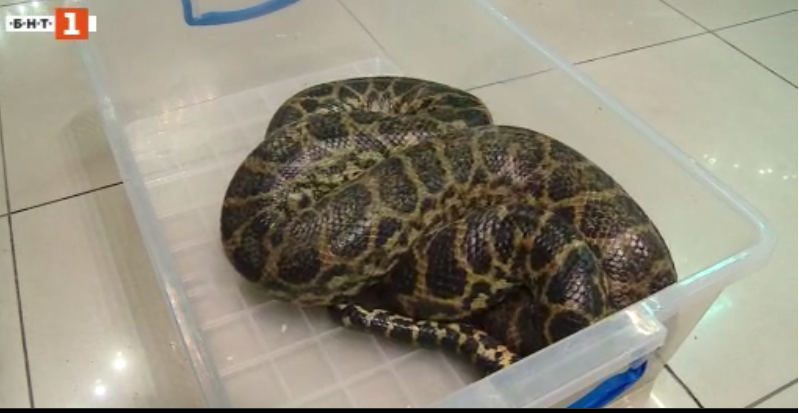 The news that a yellow anaconda walks through the stores caused panic among the visitors of the mall. The search went on for nearly 9 hours. Police officers and firefighters joined the search for the reptile. Shortly before 21.00, the snake was caught by its owner. Ivo Katrafilov, owner of the snake: I caught it with hands, not a dangerous animal. It's not as big as it was described in the news. It is about 2 metres long. It is our own animal, a pet, which was in the shop for two days, because of some repairs at home. The box I placed it in was obviously defective and at the lunch break the snake escaped. The snake is registered in the regional eco-inspection. It is a yellow anaconda from the boa family. According to experts it is not dangerous to people. The Management Board of the shopping centre decided to terminate the contract with the owner of the snake for the rent of the pet shop.